1-16 –Maria Callas With The Orchestra Of RAI, Turin* Suicidio! 3-10 –Risë Stevens Connais-tu Le Pays? 5-3 –Ivo Zidek* With The Orchestra Of The National Theatre, Prague* Jenik's Aria: How Could He Believe? 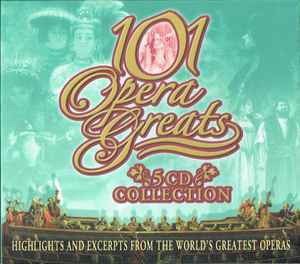 Highlights and excerpts from the world's greatest operas. Distributed by Prism Leisure Corp. Plc, PO Box 481, Enfield, EN3 7SX, England. This compilation ℗ & © 2005 Prism Leisure.